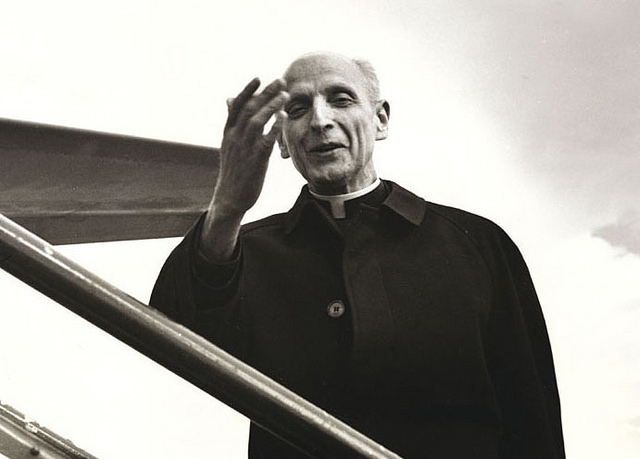 Father Pedro Arrupe, S.J., in 1968 (ARSI Roma). The ceremony for the opening of the cause for the beatification and canonization of Pedro Arrupe, S.J., the Father General of the Society of Jesus from 1965 to 1983, will take place at the Apostolic Palace of the Lateran, in Rome, next to the basilica of St. John Lateran on Tuesday, Feb. 5, 2019. The announcement was made from the Jesuit headquarters in Rome in a press communiqué released on Jan. 30. Arturo Sosa, S.J., the current Superior General of the Society, invited Jesuits around the world to participate in the opening session however possible. He said the pope’s vicar-general for the diocese of Rome, Cardinal Angelo De Donatis, will preside at the ceremony, which will be held at 4 p.m. The event can be streamed online at https://telepacenews.it/diretta. As reported in America, Father Sosa first raised the possibility of the cause for Arrupe being opened at a meeting with Jesuits and lay associates involved with the International Association of Jesuit Universities in Bilbao, Spain. Two days later, on July 13, the postulator for the cause, Father Cebollada, said that he was compiling the writings of Father Arrupe and soliciting testimony from eyewitnesses who can attest to the holiness of the man who led the Jesuits in the energetic yet turbulent years after the Second Vatican Council. The process for canonization that will be formally opened on Feb. 5 will involve compiling the writings, hearing the sworn testimonies and evaluating the information gathered. Depending on the investment of Jesuit resources, that phase could move with relative speed, and take perhaps two or three years or less. When that phase is completed, the documentation will be forwarded to the Congregation for the Causes of the Saints. Once there, the cause could proceed quickly, as in the causes of John Paul II and Mother Teresa of Calcutta, especially if there are no theological objections and Father Arrupe enjoys what the church calls “the fame of sanctity,” in other words, that he is venerated as a holy person, and there is one miracle attributed to his intercession. Father Arrupe was born in the Basque region of Spain in 1907. After some years of medical training, he joined the Jesuits in 1927. After the Republican government in Spain expelled the Jesuits from the country in 1932, he continued his studies in Belgium, Holland and the United States. Seizing the Imagination: Three Jesuits who knew Pedro Arrupe well remember him. Father Arrupe was master of novices at the Jesuit novitiate on the outskirts of Hiroshima when an American B-29 bomber flew over the city on Aug. 6, 1945, and dropped the atomic bomb. The blast blew out the doors and windows of his residence. When he and his companions went outside they saw the city of Hiroshima turning into a lake of fire and soon witnessed the first of the 200,000 casualties of that attack. He turned the novitiate into a makeshift hospital and using his medical knowledge cared for some 150 victims of that crime against humanity. As the 28th Superior General, Father Arrupe had the difficult task of guiding the Jesuits through the changes following the Second Vatican Council. He was most concerned that the Jesuits make a commitment to addressing the needs of the poor, and his work resulted in the decree from the 32nd General Congregation, Our Mission Today: The Service of Faith and the Promotion of Justice, passed in 1975. This led the Jesuits, especially in Latin America, to work in practical ways with the poor. In spite of threats against their lives—threats that led to the murder of six priests in El Salvador in 1989—the Jesuits continued their justice work with the poor, with Arrupe’s support. His commitment to justice led him to establish the Jesuit Refugee Service, a prophetic act, whose relevance is so visible today. His belief in justice informed his understanding of the goal of Jesuit education, which he believed was to form men and women for others. Father Pedro Arrupe died on Feb. 5, 1991; the cause for his canonization will be opened exactly 28 years later. Pope Francis, who has never hidden his admiration for Father Arrupe, has prayed at least twice at his tomb in the church of the Gesù in Rome. He will be on a flight back from the United Arab Emirates on Feb. 5 at the time the cause for Father Arrupe’s canonization is opened in Rome. But, if the process moves forward smoothly and rapidly, Francis could be the pope who beatifies him. In the communiqué, Pascual Cebollada, S.J., the postulator of Father Arrupe’s cause, invited all Jesuit communities “to celebrate the Eucharist on Tuesday, Feb. 5, at a time convenient to them, in thanksgiving for the life of our former Superior General on the 28th anniversary of his death.” Let's play Super Mario Bros to save Mushroom Princess now !!! The Mushroom Princess is being held captive by the evil Koopa tribe of turtles.